Hello friends!! I hope you are all having a great week and enjoying all of these beautiful homes!! What an amazing group we have had this week!! If you are new to my blog or just now tuning in, I would highly suggest starting with Day 1 to begin your tour. 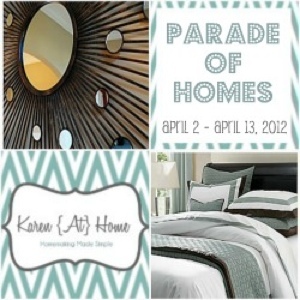 Just a reminder, the Parade of Homes goes through this Friday, April 13th. On Friday April 13th, there will be a linky party for everyone to link up their Homes!!! Please mark your calendar and start photographing those rooms in your home that you can't wait to show off!!! Today we have Amy from All In A Day showing off her beautiful home. Amy is no stranger to Karen At Home Blog! If you recall from my Life of A Stay At Home Mom series, Amy was one of my guest posters back then too. Thanks again Amy for participating as a guest blogger and for welcoming us into your beautiful home!!! Hi Karen At Home readers!!! I am so excited to be here today sharing my home with you! I had planned on doing a video tour! You know, just to switch it up a little bit. But…..that little thing called “life” got in the way and my home was in NO condition showcase via video after the Easter Bunny exploded in my house this past weekend! My name is Amy and I blog over at All In A Day. I’m wifey to my amazing hubby Scott, mama to my super cute daughter Emily, and a creative spirit who tries to fit crafts & DIY projects, cleaning, being a mommy, & being a wife all in! Yup, that’s us! This was during our sweet baby’s first birthday party! The space over the garage (on the left in this picture) is actually what is called a “carriage house”. It’s basically a 1 bedroom studio apartment. We used to use it for guest quarters, but we currently rent it out to an amazing tenant! When baby #2 comes along, we’ll definitely use this space for a guest house again! When you open the front door, you’re immediately greeted by stairs. In my next life, I would LOVE to have a real foyer. One where I can put a console table and some lamps and some art and do a little board & batten treatment on the wall! But I digress….. The baby gate is a super classy touch! To the right of the stairs is our dining room & formal living area. It’s basically one giant room. We turned the formal living into a playroom! Much more functional for our family! The other side of the room is our dining area. We installed chair rail and stenciled the top half of the wall. We still need to install the faux wainscoting on the bottom. To the left of the front door is where we spend all of our time! Up first is our kitchen! As you can see, our kitchen opens up to our family room. Here’s the view into the kitchen from the family room. Our kitchen also opens up to our breakfast nook/office area. I love my DIY chevron curtains! 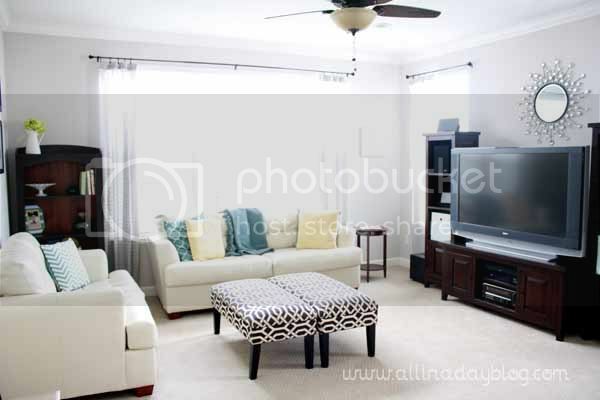 There is also a half bath off of our family room (to the left of this picture). Ok, so that’s it for downstairs! Let’s head upstairs! When you get to the top of the stairs, there is a little landing/hallway. That door you see is our laundry room. And no…..you cannot see it. Yes….it’s that bad! It’s on my list of rooms to makeover! This little hallway leads to all 3 bedrooms in our home. Above, the room on the left is our guest room, and the room on the right is Emily’s room. There is a Jack & Jill bathroom in between the 2 bedrooms. Yeah…not showing that one either! Here’s our guest room. I’m literally right in the middle of working on this room. I changed out the bedding and curtains (there are white curtains hanging….you just can’t see them). I still need to add some art. And here’s Emily’s room (these pictures are a little old – from when we first put together her nursery)! Across the hallway is the master “wing”. It’s a big, long hallway that leads to our bedroom. Along the hallway is our closets and our bathroom. Here’s our NEW master bathroom!!!! Well, for now. I still need to frame out the mirrors, switch out the light fixtures, and maybe add a chandelier over the tub! And of course, I can’t redo the bathroom without redoing the bedroom! So here is our new master bedroom! I literally finished painting those curtains on Wednesday! Just in time! Still gotta hide those darn TV cords! So embarrassing, but I’m all about keepin’ it real (complete with my bra on the dresser. ugh)! And of course our house is always a work in progress. I still need to add some art and pictures to our bedroom. But I’m loving how it turned out! The last stop on the tour is our backyard. We added a deck last October. We absolutely love the space now and enjoy having family dinners under the gazebo and entertaining here. And that concludes the tour of our humble abode!! I hope you enjoyed! Thank you Karen for hosting such a great series and allowing me to be a part of it! I’d love it if you stopped by my blog and said hi! Where did you get those awesome khaki/white stripe curtains? i've been on the hunt for some EXACTLY like that? Great house!